This 90-kilometre trek, run by Peregrine Adventures for private groups only, follows the trail used during World War II, taking in mountain passes, snaking along ridges and descending into deep gullies. Along the way you will visit small, isolated villages, war sites, ancient forests and extinct volcanic craters. Peregrine works with a local co-operative to ensure villages and communities benefit directly from visitors walking the Kokoda Track. The co-operative involves 11 villages along the trail and our porters and guides come from these villages – direct descendants of the ‘Fuzzy Wuzzy Angels’ who assisted Australian troops in World War II. This trip operates for private groups only. Contact Peregrine Adventures for private group booking information. Physical preparation is essential, you will trek on terrain with plenty of ascents and descents, often on steep and narrow trails. You will need to complete a passenger ‘Self Assessment’ form prior to this trip. The cost of a personal porter is included in your trip price. We use a private charter flight to get our groups to and from Kokoda. Meet your Peregrine representative on arrival and transfer to your hotel. Short flight from Port Moresby to Kokoda by private charter plane. Meet your trekking crew and relax before starting the long walk tomorrow. Trek the Kokoda Track, camping and staying in huts along the way. Finish trek at Owers’ Corner. Trek times vary from six to eleven hours per day. Transfer back to Port Moresby for your last night. This epic trip comes to an end in this morning. Arrive at Port Morseby and meet your Peregrine representative before transferring to your hotel. 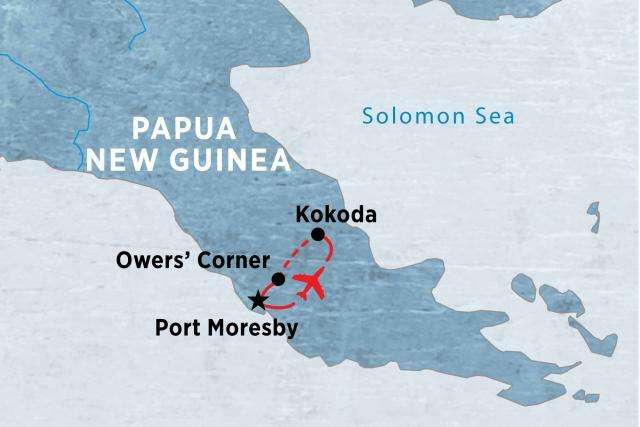 Begin this rewarding trek from Owers’ Corner and hike the Kokoda Track, camping and staying in huts each night along the route. Trek times vary from six to eleven hours per day, ascending and descending the trails that wind their way across the mountains. The trek will finish at Kokoda village. Say goodbye to your new friends when your trip ends in Port Moresby this morning. 10 breakfasts, 8 lunches, 8 dinners. Private charter flight, private vehicle, trekking. 2 nights comfortable hotel, 8 nights camping/village hut.